Life in a big Asian city is crazy, chaotic, noisy ..... in fact anything but calm and peaceful! As I was making this quilt I was wanting to bring some calm into my life, some rest. So I deliberately chose lots of neutrals with just pops of colour. some larger blocks, and some smaller, and added in some extra strips of colour where it was needed. 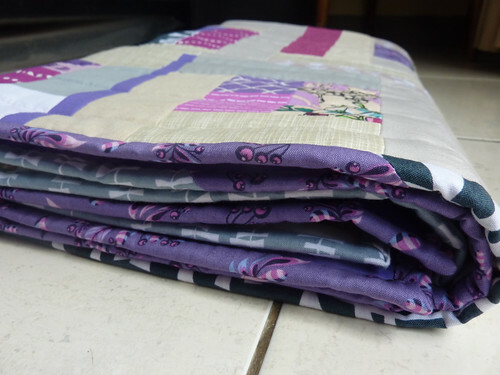 I didn't want to draw too much attention to the quilting as I felt it would take away from the blend of colours and neutrals, so I just quilted vertical wavy lines about 2" apart and added some extra hand quilting in each block with some purple perle cotton. The back is pieced together from the rest of the purple fabric in my stash. I am now completely out of purples! 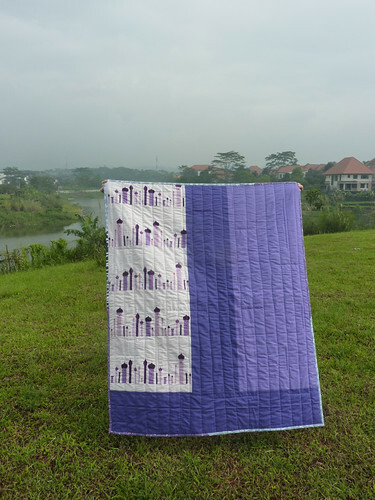 This quilt is a gift for my sister who is truly a lover of purple! It measures 40" x 47"
I love the improv nature of it, Deborah, and I agree that a non-scrappy binding would have drawn the eye. Good luck for the challenge! 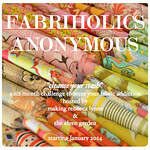 And surely being all out of purples is a reason to do a little retail therapy of the fabric kind. This is absolutely beautiful Deborah! It is pretty! I like the addition of hand stitching. Great entry and super that you are out of purples. I wish I was as they are not my favorite. Oh, I love this! It's super fabulous! I love the mix of neutrals and the pops of purple. Yum! A beautiful quilt. I am envious of your improv skills! Ooh, love the purples against those greys and neutrals. Great job, Deborah! Thanks for linking up to TGIFF! Beautiful improve pieces! I love the low volumes with the purples! Love the hand quilted bit. Your chose for the background/neutrals really makes those purples shine. Such a beautiful quilt! Love the improv! Thanks for sharing and giving me some much-needed inspiration! Beautiful Deborah - I think it has a really serene vibe. A stash without purple is a sadly depleted stash! Good luck in the challenge it is a wonderful entry. 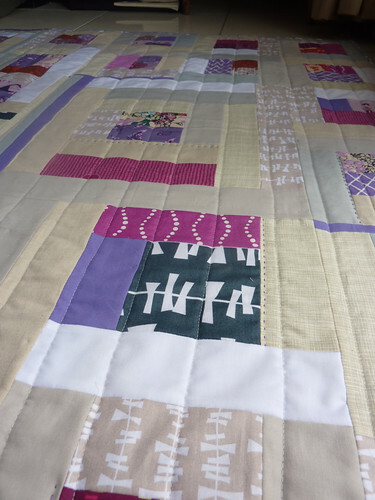 The colours, improv piecing and the addition of purple perle quilting all add up to a wonderful finished quilt! I love it! Deb it looks gorgeous - and great binding! Bravo! This is just lovely. 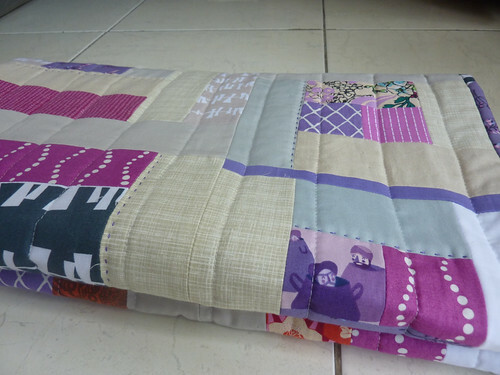 The calm colors and the improv style with just the right amount of quilting...very, very nice! 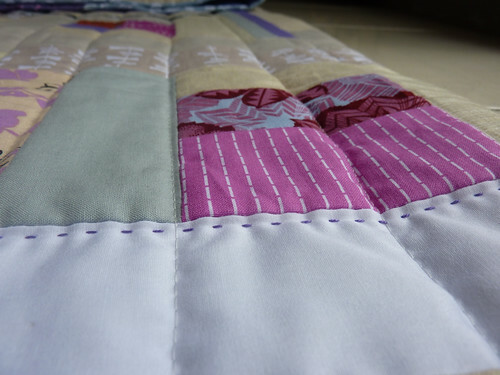 I love how peaceful this quilt is and the little bits of hand quilting are genius! I like the background fabric. It does look like a gloomy day and then you have the pops of purple. I love the colours you have used together here and the touches of hand quilting look perfect. It's so fantastic. Great finish. wonderful, love it! lucky sister! As a fellow lover of purple I have to say that I'm willing to be your sister is going to absolutely love this.